Mayo is the stuff childhood comfort food was made of; but as adults, we are expected to know better or at least order the low-fat variety. Usually I save my slather of mayo for egg salads and BLTs, but my inner child (literally) prefers a steady stream. 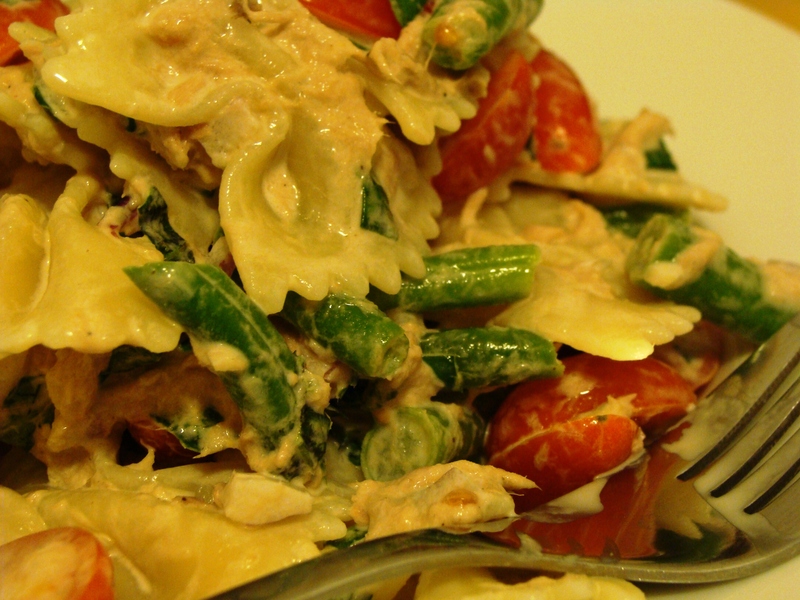 So, thought I’d make my very favorite pasta salad that comes straight from the people at Hellmann’s (food companies love to send RDs promotional samples and recipes–did you know mayo is naturally rich in Omega 3 ALA’s?). This recipe reminded me of something I had in Spain, where vinegar, fish and veggies make up many a large midday meals. Cook the pasta according to the package; drain and rinse with cold water until completely cool. In a large mixing bowl, combine mayo, vinegar, basil, garlic and pepper. Add remaining ingredients and pasta; toss well. Chill if desired. New Toy for a Healthy New Year! Happy New Year to all! 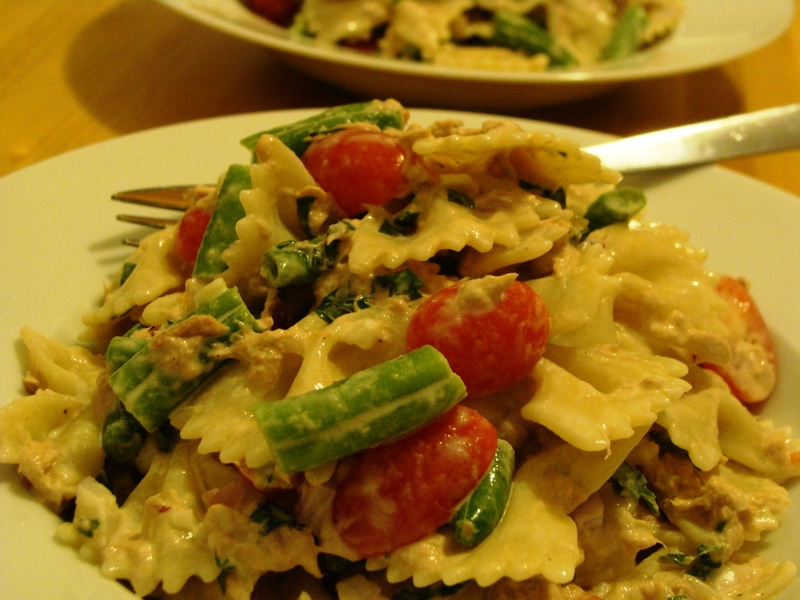 In 2010 I have an even greater reason to eat healthfully–I’m eating for two! A baby Fridge and Tunneler will appear sometime in June, no doubt with a healthy appetite. When you blog about food, and “pregnancy-induced nausea” hits for the greater portion of the first trimester, you slack a bit in the postings. A fairly good excuse, I think. While I still fit behind the sink and stove, we’ll see what the third trimester brings. So each Christmas, Mrs. Claus-in-law brings her chef-in-law a fun kitchen tool or toy. 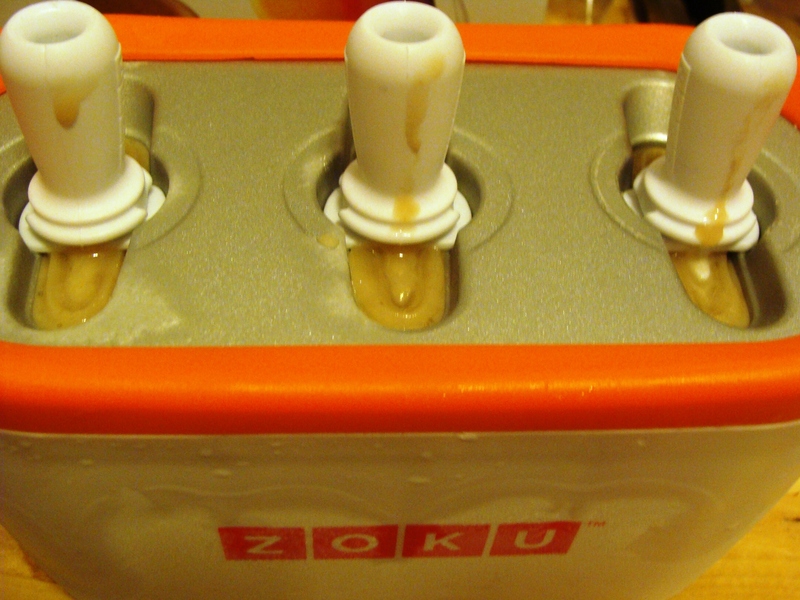 This year I may have dropped a hint for the Zoku popsicle maker, a kit that produces frozen treats in less than 10 minutes. 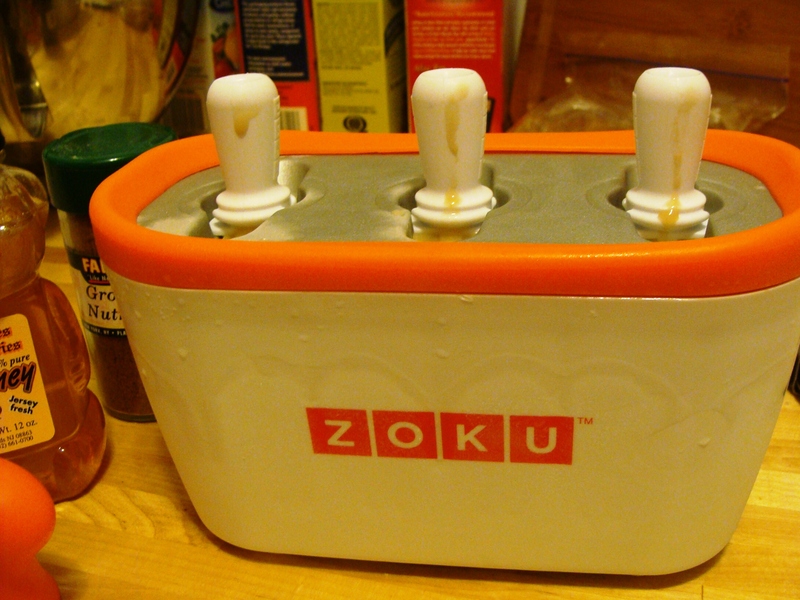 Instant gratification appropriate for the busy New Yorker (quick shout out to the Zoku company, fellow bridge and tunnelers located in Hoboken, New Jersey). I gifted the very same pop maker to my sister to make homemade treats for and with my milk-allergic niece Abigail. Here’s hoping she outgrows this allergy in 2010. What would be the first pop of the new year? I had two ripe bananas, which steered me towards a pudding-style pop. This recipe is in honor of my niece Abigail, who loves bananas and sticks to soy milk these days. Using an immersion (hand) blender or traditional blender, combine the above ingredients. 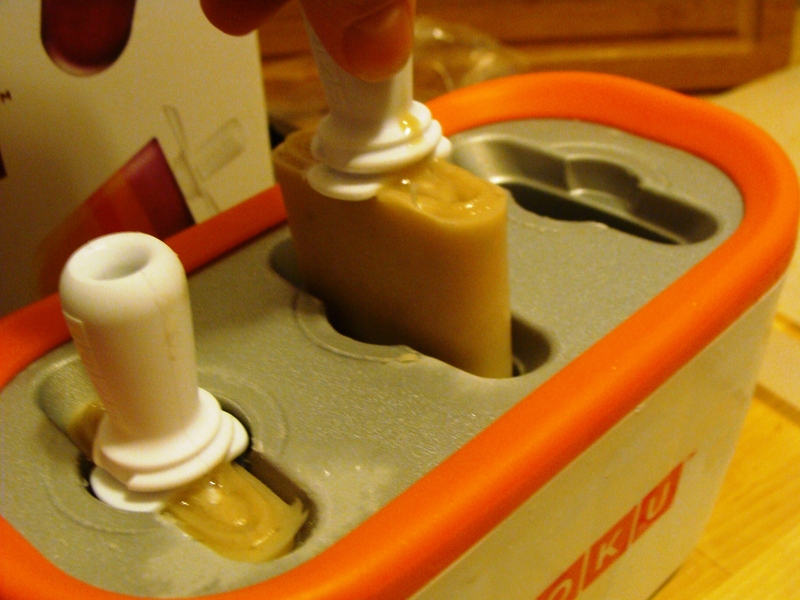 Add more soymilk if mixture is too thick to pour into popsicle molds. 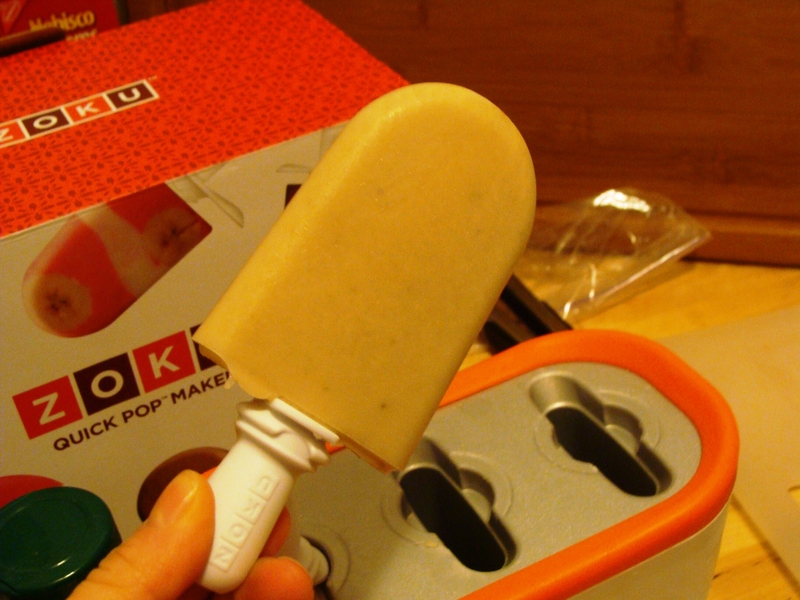 Pour into the Zoku molds, or regular popsicle molds, and follow directions for freezing.